LAS CRUCES, N.M. » Hawaii's recent history in the Western Athletic Conference tournament is littered with heartbreak. The Rainbow Warriors haven't advanced out of the quarterfinals since 2003 and three of those tournament losses have come by three points or less. So they enter tomorrow's game against Boise State looking to break that trend and snap out of a funk that resulted in six straight losses to end the regular season. "We just have to get that first break," UH coach Bob Nash said yesterday. "We've had a lot of misfortune this year with injuries and suspensions and all the travels. Now it's time for the fortunes hopefully to start turning in our favor and it would be very nice if it could happen this week in Las Cruces." The fifth-seeded Rainbows (11-18) and fourth-seeded Broncos (22-8) meet at 8 a.m. Hawaii time at the Pan American Center to tip-off the WAC tournament quarterfinals. 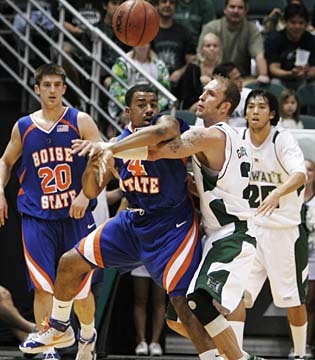 Boise State, the conference's highest scoring team, swept the regular-season series with the Rainbows. Jamar Greene and the Boise State Broncos swept Matt Gibson's Rainbows in the season series this year. LAS CRUCES, N.M. » Feeling more at home in New Mexico these days, the Hawaii basketball team wouldn't mind hanging around Las Cruces a little bit longer. The Rainbow Warriors have been in town since Saturday, giving them a chance to get comfortable in the desert community as they prepare for the Western Athletic Conference tournament. "It's a great hotel we're in, we've got all the comforts of home being on the road," UH coach Bob Nash said. "The sun is shining, we have no excuses." Sticking around into the weekend will mean breaking a couple of streaks -- a six-game skid that closed the regular season and a string of four often agonizingly tight losses in the WAC tournament quarterfinals. Take away an 18-point defeat to UTEP in 2005, and the other three games have been decided by a total of six points, the last a 73-70 loss to Utah State a year ago. "They've been so close, we just have to find a way to get over that hump," said fifth-year UH senior Bobby Nash, who was heading toward graduation at Iolani School the last time the Rainbows reached the WAC semifinals. Getting past the quarterfinal round this year doesn't figure to be any easier when the fifth-seeded Rainbows face fourth-seeded Boise State tomorrow at 8 a.m. Hawaii time at the Pan American Center. Boise State, the highest scoring team in the conference, swept the regular-season series with Hawaii, winning 95-80 in Boise on Jan. 24 and spoiling UH's senior night with a 78-71 win on March 1, when the Rainbows whittled an 18-point deficit to three before falling short. Both teams enter the tournament looking to get past disheartening losses. The Rainbows (11-18) closed the regular season by watching New Mexico State frolic to a 106-71 rout Saturday. The Broncos (22-8) haven't played since squandering a chance to finish alone atop the regular-season standings and clinch the top seed, losing 88-69 to Utah State at home last Thursday. Instead, Boise State split the title with three other teams and slid all the way to the fourth seed. Although they haven't won since mid-February, the Rainbows didn't look like a team weighed down by their struggles during practice yesterday at Onate High School. "We have to stay upbeat. Any time you go into any type of situation you don't want to be tense about it," Bobby Nash said. We came here to win and compete at the highest level and I think we're on the right track. We've had a very good three days of practice and we just have to bring it." With time ticking down on the season, the Rainbows look to take advantage of the time they have left by taking better care in executing the little things on offense. "We haven't been setting good screens, we've been slow getting to our positions. As a result we give teams time to dig in," Bob Nash said. "We need those precious seconds." Picking up the pace on defense will also be a key against a Boise State transition game that burned the Rainbows in both meetings this season. The Broncos enter the tournament as the WAC's highest scoring team and rank second in the nation in shooting at 50.9 percent. They'll have the services of center Matt Nelson this time around. Nelson (15.8 points, 7.4 rebounds per game) missed the last game with Hawaii due to a foot injury. With Nelson out, first-team All-WAC forward Reggie Larry posted 23 points and 10 rebounds while reserve Mark Sanchez contributed 14 points and eight boards off the bench. The Broncos are also dangerous from the perimeter, led by forward Tyler Tiedeman -- who is shooting 49.7 percent from the behind the arc -- and guard Matt Bauscher.